Not that you needed a reminder or anything. I used to be a Summer-or-bust kind of gal (thanks, college), but more recently, I've been feeling the blossoming possibilities of springtime. Not only is the LA weather gorgeous (that's like 87% of the time anyway), but spring signifies new life, new beginnings, and a freshness that just can't be captured during any other season. Most haircare professionals will tell you that you should get your hair trimmed at the turn of every season. That works out to about every 3 months. If you regularly apply heat to your hair (blow dryer or flat iron), or have color, keeping that diligent of a schedule is a must. You can always adjust the frequency of your trims (up or down) depending upon your hair's specific needs. But, there are three signs you shouldn't ignore when it comes to your hair.If you're stumbling upon at least one of these signs, you need to make an appointment with some scissors -- either your own, or a pair in the hands of a trusted professional. Key word: trusted. The first tell-tale sign that it's time for a trim is a fairly easy one to recognize. If you're like me and have a holy grail product that detangles your hair like it's nobody's business (for me it's Be Kekoa Bae Clean), and all of a sudden it's not working, that's a sign. True enough, your HG product not working could also be a sign that it's time for a shampoo. But if you notice it stops working riiiiight around the ends of your hair, shampoo ain't gonna fix that. Break out the scissors. You don't have to trim everything that's tangled -- just examine your ends closely (when dry) and you'll be able to pinpoint exactly where the troublemakers are. Once you nip them in the bud, detangling will become a breeze again, and all will be right with the universe. For the past few weeks, I've been in a styling slump without the slightest clue as to why. I couldn't quite blame it on the styling products -- they're pretty much the same. 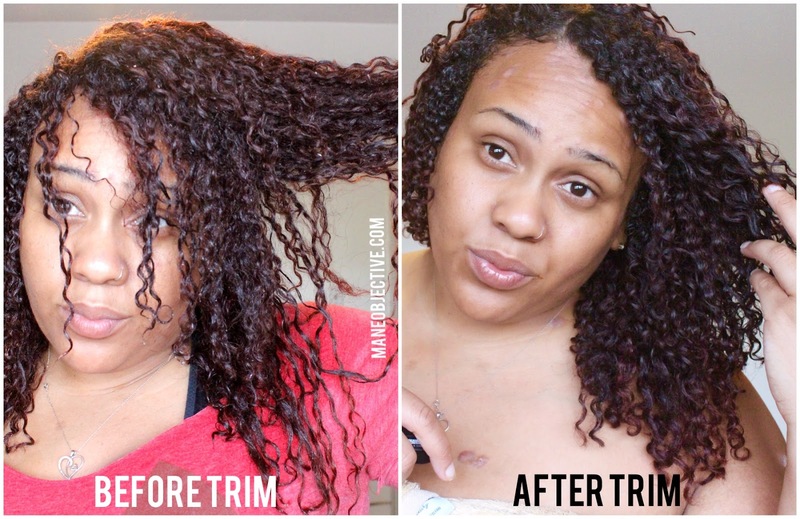 I know which curl definers are a slam dunk for me (click here to read more about those). I wanted to blame my frequent workouts, but refreshing should be able to fix that. It seemed like no matter how I banded or pineappled, my hair was a mess the next day -- it just fell wrong. Believe it or not, a trim solved all that. 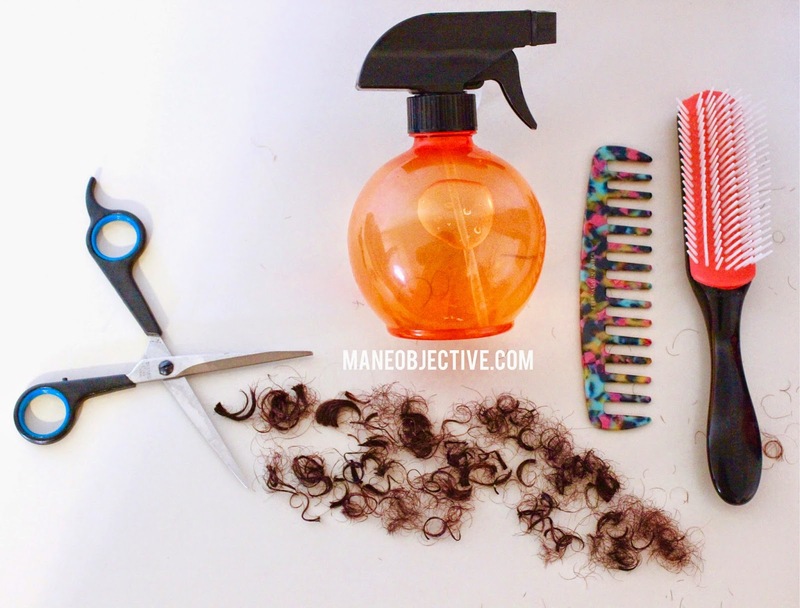 As our hair grows out, the curls get weighed down and causes our natural hair to lose shape. Further compounding the problem, gnarly ends make otherwise healthy curls look limp and blah. Trimming away the dead weight will put the spring right back in your curls. 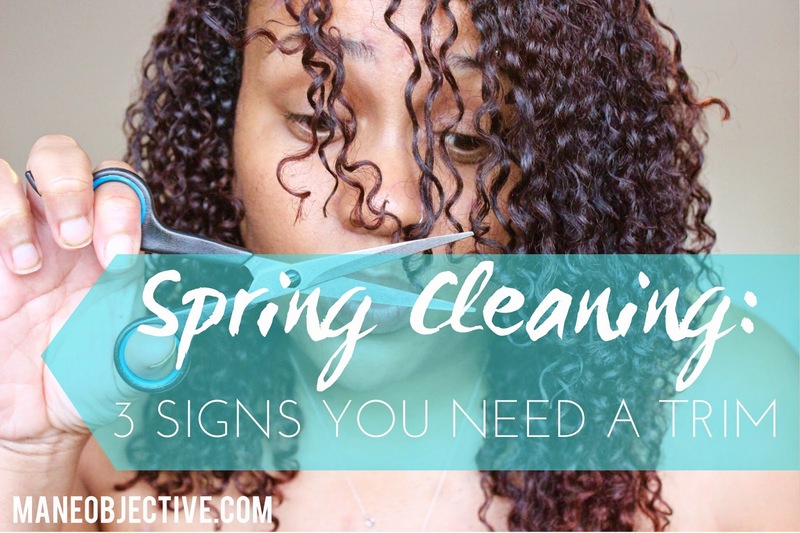 If on wash day you start seeing more wisps of breakage (you know what those little C and S shaped tendrils look like) than normal, you're likely due for a trim. Yes, some breakage is normal, but protein treatments and protective styling will only get you so far. Our ends weather and suffer cuticle damage as they age, leading to increased breakage. Nip breakage in the bud and keep your hair healthy by maintaining regularly scheduled trims. All 3 signs had to hit me before I realized I was due for a trim. Don't be like me and ignore the warnings. How does your hair tip you off that it's time for a trim? Happy Spring cleaning!